Be the first to share your favorite memory, photo or story of Jesse. This memorial page is dedicated for family, friends and future generations to celebrate the life of their loved one. Jesse James Garcia, age 22, was born January 2, 1997 to Jesse Chapparo Garcia and Kristie (Giffrow) Garcia in Altus, Oklahoma. Jesse graduated from Olustee high school in May of 2015. He spent the summer of 2014 in British Columbia, Canada. Jesse lived in Lawton, Oklahoma for a year before returning to the Altus area. He had worked for several restaurants in Lawton and Altus as a cook. Jesse enjoyed playing on-line games with his many friends. He made short humorous videos that he posted to his face book account. He was very good at imitating character voices and making people laugh. He collected movies, movie memorabilia, video games from the 80's and vintage video game memorabilia. He was a very aspiring writer of short stories, as well, as poems and Japanese haikus. 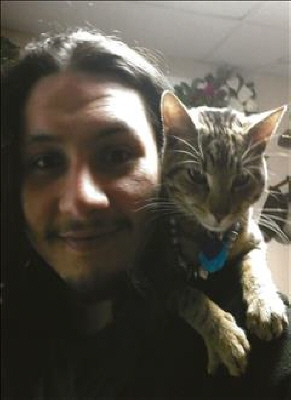 Jesse was preceded in death by his father Jesse Chapparo Garcia of Olustee, Oklahoma, formerly of Long Beach California. Jesse is survived by his mother Kristie L. Garcia of Olustee, Oklahoma, formerly of Chesapeake, Virginia, brothers Frank C. Garcia of Olustee, Ok., half brother, Jeffry J. Garcia of Corona, California, sister CaSondra L. Garcia of Olustee, Ok. grandfather, Marvin L. Giffrow of Olustee, formerly of Chesapeake, Virginia, grandfather, Jesse P. Garcia of Hayward, California. There will be a come and go visitation for Jesse on Wednesday from 9:00 a.m. to 9:00 p.m. at Lowell Tims Funeral Home in Altus, Oklahoma. Cremation arrangements are under the direction of Lowell - Tims Funeral Home in Altus, Oklahoma. To send flowers or a remembrance gift to the family of Jesse James Garcia, please visit our Tribute Store. "Email Address" would like to share the life celebration of Jesse James Garcia. Click on the "link" to go to share a favorite memory or leave a condolence message for the family.